Calvinism and What is Predestination? John Calvin, TULIP, and What is Predestination? There has been a minor resurgence of Calvinism amongst some Protestants in the USA and elsewhere. Even COG-related groups like CG7-Denver seem to have been somewhat affected (or at least confused by parts of it). This article will discuss John Calvin, some of his doctrines, and explain the biblical truth about predestination as this is an area that most affiliated with Christianity do not understand at all. A sermonette related to this is also available: Tulip Predestination? 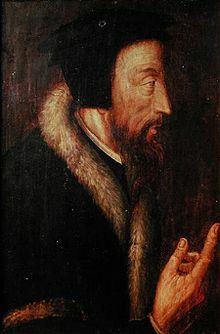 John Calvin (Middle French: Jean Cauvin) was born on 10 July 1509 and died on 27 May 1564. He became a leading French theologian of the Protestant Reformation. He broke away from the Roman Catholic Church in is 20s. John Calvin later fled to Basel, Switzerland. He started to have increased fame in 1536 when he published the first edition of his work improperly titled as Institutes of the Christian Religion. He worked to persuade people to his faith in Geneva and elsewhere. "The Lord so blinded them and delivered them up to a reprobate mind, when he wished them to be examples of horrible blindness and prodigious stupidity [specula horrendae caecitatis, et prodigiosi stuporis]." "I have had much conversation with many Jews: I have never seen either a drop of piety or a grain of truth or ingenuousness—nay, I have never found common sense in any Jew." Jérôme-Hermès Bolsec, a physician in Geneva, attacked Calvin’s doctrine of predestination and accused him of making God the author of sin. Jérôme-Hermès Bolsec was banished from the city for his actions when John Calvin had influence. On 20 October the replies from Zürich, Basel, Bern, and Schaffhausen were read and the council condemned Servetus as a heretic. The following day he was sentenced to burning at the stake, the same sentence as in Vienne. Calvin and other ministers asked that he be beheaded instead of burnt. This plea was refused and on 27 October, Servetus was burnt alive—atop a pyre of his own books—at the Plateau of Champel at the edge of Geneva. (John Calvin, Wikipedia, viewed 05/22/10). The reality is that infant baptism was NOT part of the early Christian faith (see Baptism and the Early Church) and this is not only an area that John Calvin did not "reform", he instituted non-Christian persecution against those that held to the original (and biblical) practices of the Christian faith. He was a persecutor (Persecutions by Church and State) and also failed to understand that Christians were not to be carnal warriors in this age (Military Service and the Churches of God: Do Real Christians Participate in Carnal Warfare?). The Anabaptists, like the earliest Christians, endorsed a millennial teaching (see Did The Early Church Teach Millenarianism? ). But even though the Bible teaches it, John Calvin condemned it. The true Church of God taught that God had an encompassing plan of salvation, including apocatastasis (see Hope of Salvation: How the Continuing Church of God differ from most Protestants). Within the Church of Rome, this belief got somewhat lost as it replaced part of this teaching with a doctrine about a place it called purgatory (see Did the Early Church Teach Purgatory?). Predestination we call the eternal decree of God, by which He hath determined in Himself what He would have to become of every individual of mankind. For they are not all created with a similar destiny; but eternal life is foreordained for some, and eternal damnation for others. (Calvin, John. Free Will and Predestination. From Institutes of the Christian Religion (1537). Translated by John Allen (1813). Excerpted from Reading About the World, Volume 2. American Heritage Custom Books, 1999. Notice that God sent Jesus to die for all, not just the elect. The plan of God is all about love. While the Bible does teach about an elect being called in this age (cf. 2 John 1), others will have a chance to be forgiven in the age to come (cf. Matthew 12:32; 11:22-24; Ephesians 1:21; see also our free online booklet Universal OFFER of Salvation, Apokatastasis: Can God save the lost in an age to come? Hundreds of scriptures reveal God's plan of salvation). Sadly, this was not understood by the leading Protestant reformers. Many still believe that most will be lost. That the vast majority of mankind will be lost. The Bible is clear that while some are blinded now and an elect has been predestined to be saved in this age, that salvation will be offered to all (please see our free online book Universal OFFER of Salvation, Apokatastasis: Can God save the lost in an age to come? Hundreds of scriptures reveal God's plan of salvation). The Bible is also clear that there is only one sin that will not be forgiven in the "age to come" and that has to do with blasphemy of the Holy Spirit (see What is the Unpardonable Sin?). But according to John Calvin, apparently by not being predestined to be his type of Protestant, is supposedly predestined to eternal condemnation. John Calvin has apparently condemned over 98% of humanity throughout history to be lost. 20 Our God is the God of salvation (Psalm 68:20). But, this is not truly the position of Calvinists, and certainly was not really the position of John Calvin. (It should be noted, however, that some Presbyterians are wondering about all of this and are starting to take a broader view on this. For details, see the news item Presbyterians Open to the Idea That God’s Plan is Not Closed). Some have claimed that even John Calvin himself did not believe in what is now known as five-point Calvinism, often abbreviated as TULIP. And while what John Calvin personally believed on all five points is of little interest, what I do wish to do here is to analyze what has been reported as the five-point doctrine known as TULIP. T for "total depravity", U for "unconditional election", L for "limited atonement", I for "irresistible grace", and P for "p perseverance of saints". I will try to address each point by point. So, "total depravity" could be considered to have minimized the above. Now it is true that the Bible teaches that in Adam all die (1 Corinthians 15:22), but it also teaches that men are capable of responding positively to God's calling (Acts 2:38-41; John 6:44; Revelation 17:14; Matthew 20:16). Although God must call, humans can respond. U - Unconditional election: From eternity past, God chose certain men to be saved by His grace, without regard to any merit foreseen in them. Now, God did predestine that an elect would be saved (Ephesians 1:3-12). And this is by His grace (Ephesians 2:8), which is the gift of God. But some faith has to be exercised (Ephesians 2:8) and it would appear that God, who wants none to perish (2 Peter 3:9), would be careful to call only those who could be saved in this age (see What is the Unpardonable Sin?). Jesus made it clear that, "many are called, but few chosen" (Matthew 20:16; 22:14). This indicates that salvation in this age has some conditions or all called in this age would be chosen. Since God is all knowing and just (Isaiah 45:21), there was logically some type of reason that the elect are selected; not that the elect are of themselves better, but there are probably several reasons (cf. 1 Corinthians 1:26-29). L: Does the Bible Teach Limited Atonement? L - Limited atonement: God sent His Son to make full and effective payment only for the sins of the elect, those He had predestined for salvation. There is not one verse in the entire Bible that teaches that the atonement was meant to be limited to the elect who are now being called. This was also not the view of even those originally associated with the Greco-Roman churches (see Some Similarities and Differences Between the Eastern Orthodox Church and the Continuing Church of God and Which Is Faithful: The Roman Catholic Church or the Continuing Church of God?). Notice that John is teaching that Jesus was not just a propitiation (an atonement offering) for the elected Christians, but for the entire world. Jesus was not an offering for the others in order for none of them to be saved! 9 And Jesus said to him, "Today salvation has come to this house, because he also is a son of Abraham; 10 for the Son of Man has come to seek and to save that which was lost." Notice that Jesus came to save the lost, not just a small amount of elect people. The idea of Jesus coming to save more than a few is clearly being taught. Will He not succeed? Again, can Jesus be Savior of all without offering salvation to all? Is Jesus intending to draw all to Him in order to eternally punish most or to save them? Notice that Christ will bear the sins of many (the word in Greek, polus, implies most). So while not all will accept His sacrifice, clearly many will. Does Jesus intend for most of His creation to suffer eternally? Is God not intelligent enough to plan a creation that will result in nearly all being saved? 15 But the free gift is not like the offense. For if by the one man's offense many died, much more the grace of God and the gift by the grace of the one Man, Jesus Christ, abounded to many. 16 And the gift is not like that which came through the one who sinned. For the judgment which came from one offense resulted in condemnation, but the free gift which came from many offenses resulted in justification. 17 For if by the one man's offense death reigned through the one, much more those who receive abundance of grace and of the gift of righteousness will reign in life through the One, Jesus Christ. 18 Therefore, as through one man's offense judgment came to all men, resulting in condemnation, even so through one Man's righteous act the free gift came to all men, resulting in justification of life. 19 For as by one man's disobedience many were made sinners, so also by one Man's obedience many will be made righteous. 20 Moreover the law entered that the offense might abound. But where sin abounded, grace abounded much more, 21 so that as sin reigned in death, even so grace might reign through righteousness to eternal life through Jesus Christ our Lord. Since Jesus' free gift is for all men, will not all humankind have an opportunity to receive it? Since by one Man's obedience many will be made righteous certainly many does not mean a few. For grace to reign, does this not mean that most will accept it? All died in Adam, all will be made alive in Christ. All will have an opportunity for salvation, not just a few. 25 Shall not the Judge of all the earth do right? Certainly properly offering salvation to everyone is the right thing a loving God would do. Does your church believe that God will do right by all? Notice that Jesus will reconcile all to Himself having made peace through His sacrifice. A sacrifice that will be made available to all. For Your judgments have been manifested." Notice that all the nations shall come and worship God. Notice that the implication of verse 5 is that only very few will not glorify God's name. Has your church judged those that even God the Father has not judged? Does Jesus will to give life to the many or to the few? My church teaches that my God is a loving God who has a plan that will offer salvation to all and that nearly all (probably over 99.9%) will accept Jesus' offer of salvation. 1 Timothy 4:9-11, is Paul teaching that is Jesus the Savior of all men or only a few? 9 This is a faithful saying and worthy of all acceptance. 10 For to this end we both labor and suffer reproach, because we trust in the living God, who is the Savior of all men, especially of those who believe. 11 These things command and teach. 25 Therefore He is also able to save to the uttermost those who come to God through Him, since He always lives to make intercession for them. 26 For such a High Priest was fitting for us, who is holy, harmless, undefiled, separate from sinners, and has become higher than the heavens; 27 who does not need daily, as those high priests, to offer up sacrifices, first for His own sins and then for the people's, for this He did once for all when He offered up Himself. Notice that Jesus is able to save the uttermost--they are those that are not now near to Him. Also, notice that Jesus died for all and not just a small amount of elect. 6 And He said to me, "It is done! I am the Alpha and the Omega, the Beginning and the End. I will give of the fountain of the water of life freely to him who thirsts..."
Does this sound like Jesus intends that salvation will be available to all or only a relative few? Notice that Paul clearly teaches that Jesus has died for all. Not a few elect (like the Calvinists teach), not the relative few that accept Christ in this age (as most Protestant/Baptist/Evangelicals teach), not a minority of humankind (as most Roman Catholics teach). For Jesus to die for all, ALL must have an opportunity for salvation. And since God is all knowing, certainly He knows how to have a plan of salvation where the most possible will be saved. ...all flesh shall see the salvation of God. Salvation will be offered to all who ever lived, with a few understanding the offer in this age, and everyone else in the age to come. The Bible simply does not teach that there is a limited atonement only for the elect. I - Irresistible grace: Those God elected to salvation and for whom Christ died He effectively calls by regeneration from spiritual death, thus rendering them capable of expressing saving faith. But people like John Calvin failed to realize that while some (the predestined elect) are to be called now, all who were not called into this life will have an opportunity for such calling later, in the age to come. While Calvinists may wish to imply that this means unconditional election, it actually means that those that did not seek God in this age will find him in the age to come. And one of the problems with "Calvinism" is that it ignores that there is an age to come. 24 "I was not sent except to the lost sheep of the house of Israel." 23 But the hour is coming, and now is, when the true worshipers will worship the Father in spirit and truth; for the Father is seeking such to worship Him. 24 God is Spirit, and those who worship Him must worship in spirit and truth. 19 Repent therefore and be converted, that your sins may be blotted out, so that times of refreshing may come from the presence of the Lord, 20 and that He may send Jesus Christ, who was preached to you before, 21 whom heaven must receive until the times of restoration of all things, which God has spoken by the mouth of all His holy prophets since the world began. Notice that the Bible makes clear that the idea of the times of restoration of all things, the apocatastasis, is not just a term limited to Acts 3:21 (where the Greek term apokatastasis is actually used), but that Peter is teaching that it is what God has spoken by the mouth of all His holy prophets since the world began--essentially this is the theme of the Bible--how the God of love will offer salvation to all. Notice that this time of restoration IS NOT YET here for all. But that it will come to pass. Please stop, think, and consider that Satan (a word that means enemy or adversary) and other enemies have always been around, but that a time for all is coming where there will not be any enemies of the true faith. This simply has not yet been fulfilled, but will come to pass. So, no, this section in Isaiah is NOT about the ultimate doom of sinners, but instead shows that God will have that He may have mercy on them (to learn what happens to those who actually are incorrigibly wicked, please see the article Are The Wicked Tormented Forever or Burned Up?). And my Lord has forgotten me." Yet I will not forget you..."
23 Not only that, but we also who have the firstfruits of the Spirit. Recall that it was the Holy Spirit that was first given on the Day of Pentecost (Acts 2:1-4). And that was a type of the firstfruits of the Spirit. Who are the firstfruits according to Revelation 14:4-5? 4 These are the ones who follow the Lamb wherever He goes. These were redeemed from among men, being firstfruits to God and to the Lamb. But what about Jesus? Wasn't He a type of firstfruits? 20 But now Christ is risen from the dead, and has become the firstfruits of those who have fallen asleep. For since by man came death, by Man also came the resurrection of the dead. For as in Adam all die, even so in Christ all shall be made alive. But each one in his own order: Christ the firstfruits, afterward those who are Christ's at His coming. Does not the concept of a firstfruits specifically imply that there will be later fruits? Also, the Day of Pentecost is also called, "the feast of firstfruits" in the Bible (Exodus 34:32). And even today, it pictures that God is only calling some now, but will call all others later (more information is in the article Pentecost: Is It More Than Acts 2?). Notice that God desires that all are to be saved and to come to the knowledge of the truth. Can not God make His desire, His will, come to pass? Also notice that Jesus gave Himself as a ransom for all--not just the relatively few elect--and His testimony will come to pass in due time. Are some improperly judging before due time? Notice when He will gather all: in the dispensation of the fullness of the times. Does your church teach this? If not, does it really understand what the Bible teaches. Since the intended answer to all those questions is "no", then it should be obvious that a time for God to be favorable and pour out His mercies will still come. Notice that these people are not yet saved. This is a time in the future. When is the time? Actually it is the time the veil over then nations will be destroyed (Isaiah 25:7). 1 Praise is awaiting You, O God, in Zion; And to You the vow shall be performed. 2 O You who hear prayer, To You all flesh will come. Does your church really understand that ALL FLESH will come to God? Has this happened? Are not many of the original families of the earth dead as nearly all perished in the great flood? Thus, this is something other than the millennium. This is a prophecy for the future when all will truly have an opportunity for salvation. Has this happened? Is this not for the future? Since this discusses "all generations" is it only for a millennium? Since there are nations that died out during the flood and afterwards, how can this be unless God has a time in the future for this to occur? And nations weary themselves in vain? The fact that it is of God that they now do not, clearly supports that God will offer salvation when He decides. Notice that every knee shall bow and every tongue confess that Jesus is Lord. How can they do that if they did not even hear the name of Jesus Christ in this life? Now it is important to distinguish just acknowledging Jesus is the Christ does not grant salvation--even the demons know (James 2:19). But certainly acknowledging that Jesus is the Christ is an important step and one that is necessary for salvation (Acts 2:38-39;4:10-12). According to the multitude of His mercies. 33 For He does not afflict willingly, Nor grieve the children of men. He does not afflict willingly, but according to His mercies for the plan which will allow Him to show the most possible compassion. God will at that time cause them to know Him. This simply has not yet happened, but will. And notice that this will be a time that people will realize that they have relied on false religious ideas of others (often called traditions). An article of related interest may be Tradition and Scripture: From the Bible and Church Writings. Notice that His grace is shown in the ages to come. Has your church judged Him before the time? Has the grace of God yet appeared to all men? Of course not. Thus, there is certainly a prophetic implication of this passage by Paul. What about the expression "has appeared"? Does that mean that God's grace has been seen already by every one? No. There is a mistranslation of word order. hath appeared... For.. the... grace... of.... God...that bringeth.....salvation to all..men (Interlinear Transliterated Bible. Copyright (c) 1994 by Biblesoft). It has appeared that the grace of God brings salvation to all men. Paul goes on to state that for those who now know, they need to living Godly lives in this present age (Titus 2:12). 5 Therefore judge nothing before the time, until the Lord comes, who will both bring to light the hidden things of darkness and reveal the counsels of the hearts. Then each one's praise will come from God. Notice that God will be praised and that judgment is not be before the time when the Lord comes. Why then do most professing Christians have a judgment that condemns most who have ever lived? Notice that this prophesy specifically states that a time is coming when all things will be subject to Him. This will be the time that all who have not had an opportunity will have an opportunity for salvation. Notice that there is a future time when they shall be His people. 26 For there is nothing covered that will not be revealed, and hidden that will not be known. 22 For there is nothing hidden which will not be revealed, nor has anything been kept secret but that it should come to light. 23 If anyone has ears to hear, let him hear. 17 For nothing is secret that will not be revealed, nor anything hidden that will not be known and come to light. 18 Therefore take heed how you hear. 2 For there is nothing covered that will not be revealed, nor hidden that will not be known. 29 So Jesus answered and said, "Assuredly, I say to you, there is no one who has left house or brothers or sisters or father or mother or wife or children or lands, for My sake and the gospel's, 30 who shall not receive a hundredfold now in this time — houses and brothers and sisters and mothers and children and lands, with persecutions — and in the age to come, eternal life. 31 But many who are first will be last, and the last first." 29 So He said to them, "Assuredly, I say to you, there is no one who has left house or parents or brothers or wife or children, for the sake of the kingdom of God, 30 who shall not receive many times more in this present time, and in the age to come eternal life." The fact that almost all sin, including blasphemy against Jesus can be forgiven in the "age to come" shows that even current sinners can still be forgiven after the resurrection (see also What Did Early Christians Understand About the Resurrection?). The fact that many of the first shall be last and the last first shows that there will be some called later in the age to come. The fact that the time all who blasphemed the Holy Spirit will realize that they are the only ones NOT forgiven in the "age to come" shows that all others can be (see also What is the Unpardonable Sin?). 8 To me, who am less than the least of all the saints, this grace was given, that I should preach among the Gentiles the unsearchable riches of Christ, 9 and to make all see what is the fellowship of the mystery, which from the beginning of the ages has been hidden in God who created all things through Jesus Christ; 10 to the intent that now the manifold wisdom of God might be made known by the church to the principalities and powers in the heavenly places, 11 according to the eternal purpose which He accomplished in Christ Jesus our Lord. 26 the mystery which has been hidden from ages and from generations, but now has been revealed to His saints. 27 To them God willed to make known what are the riches of the glory of this mystery among the Gentiles: which is Christ in you, the hope of glory. 28 Him we preach, warning every man and teaching every man in all wisdom, that we may present every man perfect in Christ Jesus. The mystery has to do with God's plan to offer salvation. It was HIDDEN from generations, hence there was no way that most could have had salvation prior to Christ. And it is still a mystery that most do not know even today. Notice that the above shows that there will be some who after everything is restored will be accursed. Thus while most will accept the offer of salvation, some few sadly will wish to remain in their sins ("sin is the transgression of the law", 1 John 3:4, KJV). Notice that the time of final judgment has not yet come. John Calvin apparently never understood the "age to come" that Jesus and others in the New Testament taught about (or the Old Testament for that matter). P - Perseverance of Saints, But Can One's Election Be Lost? P - Perseverance of saints: Those God elected in Christ, called in regeneration, and justified by faith He continually quickens so they will never fall from His grace but only enter eternal glory. The above simply falls flat as a clear contradiction to scripture. 4 For it is impossible for those who were once enlightened, and have tasted the heavenly gift, and have become partakers of the Holy Spirit, 5 and have tasted the good word of God and the powers of the age to come, 6 if they fall away, to renew them again to repentance, since they crucify again for themselves the Son of God, and put Him to an open shame (Hebrews 6:4-6). Thus, salvation can be lost. Peter would have no reason to encourage people to make their elections sure if they could not stumble and lose it. The fact that one can be "disqualified" is proof that salvation is not guaranteed under any and all circumstances. The grammatical implications of the above are that they that do NOT endure to the end will NOT be saved. Furthermore, the Book of Revelation records 7 statements that it will be those who overcome who will make it (Revelation 2:7,11,17,26;3:5,21;21:7). Notice that those that violate them do not make it. The saints have patience and keep His commandments (Revelation 14:12) (see also Were the Pharisees Condemned for Keeping the Law or Reasoning Around it?). Again, there would be no point in Jesus making such a statement if there was no freewill. The elect can make decisions that will affect them eternally. While saints are to persevere (Revelation 3:10), they still can lose their election and salvation or Paul would not have written what he did. Perhaps it should be pointed out, that TULIP basically indicates that about 2% of people will be saved because of God's love and the remaining 98% will fry in torment for all eternity. As it turns out, most of those who heard of Jesus were of European stock, so I have long considered this doctrine to be somewhat racist. It condemns all who never heard the truth about Jesus, which would include many of the masses in Asia, various islands, the early Americas, and much of Africa. But contrary to the views of Calvinists, God has a plan for all (for some details, with hundreds of scriptures, please see free online booklet Universal OFFER of Salvation, Apokatastasis: Can God save the lost in an age to come? Hundreds of scriptures reveal God's plan of salvation). This emphasis on God’s sovereignty, predestination, and election of some to salvation (thus, others are predestined to damnation) is commonly called Calvinism. It is heard most often in churches of the Reformed persuasion, along with some Presbyterian and Baptist groups. Calvinists do not deny that man has a modicum of free will; they see it as some of the means by which God carries out His eternal decrees. Those of us who resist one or more of the TULIP points above do not deny the control of God over human history. But we believe that, in matters of trusting Jesus and persevering in faith, God enables the free will of man and yields to it. CG7 apparently does not really understand TULIP. They should know that some are called for election now, all have freewill, and all should trust Jesus. God is sovereign and He has a plan. A plan that will offer salvation to all who ever lived. But God will not force any to accept it. And that is correct. Some are predestined to be called. The Calvinistic view that the vast majority of human beings were predestined to be eternally punished is a horrific misunderstanding of this doctrine. Much more on predestination can be found in the article Predestination: Did God really call You? Why? Calvinist Views of the "Eighth Day"
Calvinists have confusion on other matters as well. The "eighth day" doctrine is one of them. Were we disposed to make an allegory of the eighth day, theirs would not be the proper mode of it. It were much better with the early Christians to refer the number eight to the resurrection, which took place on the eighth day...(Calvin J. The Institutes of the Christian Religion, Volume 3. Original edition, 1536. BiblioBazaar, LLC, 2009, p. 395). Actually, the number eight came from Gnostic writings and was condemned (see Valentinus: The Gnostic Trinitarian Heretic). Under what name or designation is the Christian Sabbath foretold in the Old Testament? A. Under the name of the EIGHTH DAY, Ezek. 43:27 -- "And when these days are expired, it shall be that upon the EIGHTH DAY, and so forward, the priests shall make your burnt offerings upon the altar, and your peace offerings: and I will accept you, Saith the Lord." Q. 12. Why called the eighth day? So, there is a Calvinist claim that Ezekiel was prophesying an eighth day to replace the Sabbath? 18 And He said to me, "Son of man, thus says the Lord GOD: 'These are the ordinances for the altar on the day when it is made, for sacrificing burnt offerings on it, and for sprinkling blood on it. 19 You shall give a young bull for a sin offering to the priests, the Levites, who are of the seed of Zadok, who approach Me to minister to Me,' says the Lord GOD. 20 You shall take some of its blood and put it on the four horns of the altar, on the four corners of the ledge, and on the rim around it; thus you shall cleanse it and make atonement for it. 21 Then you shall also take the bull of the sin offering, and burn it in the appointed place of the temple, outside the sanctuary. 22 On the second day you shall offer a kid of the goats without blemish for a sin offering; and they shall cleanse the altar, as they cleansed it with the bull. 23 When you have finished cleansing it, you shall offer a young bull without blemish, and a ram from the flock without blemish. 24 When you offer them before the LORD, the priests shall throw salt on them, and they will offer them up as a burnt offering to the LORD. 25 Every day for seven days you shall prepare a goat for a sin offering; they shall also prepare a young bull and a ram from the flock, both without blemish. 26 Seven days they shall make atonement for the altar and purify it, and so consecrate it. 27 When these days are over it shall be, on the eighth day and thereafter, that the priests shall offer your burnt offerings and your peace offerings on the altar; and I will accept you,' says the Lord GOD." (Ezekiel 43:18-27). Even a cursory reading of the above should make it clear to normal people that Ezekiel was not prophesying that the seventh-day Sabbath would be changed to Sunday. But this is the type of argument that Sunday is actually based upon. And if an eighth day was being predicted, why does the New Testament never call anything but events related to circumcision, the eighth day? One simply cannot accept “eighth day” weekly worship service theology for Christians unless one has a prior, and non-biblical, commitment to such a non-scripturally supported position (perhaps because of upbringing and peer pressure). Such “eighth day” weekly worship teachings are not mentioned in the New Testament. So, John Calvin taught the "eighth day", which is unscriptural and he knowingly tolerated non-biblical festivals. Apparently, he valued power or influence beyond the Bible when it suited him. If he would have understood the biblical Holy Days (Is There "An Annual Worship Calendar" In the Bible? ), instead of compromising for unbiblical ones (Did Early Christians Celebrate Easter? and What Does the Catholic Church Teach About Christmas and the Holy Days? ), he may have had a better understanding of salvation (Hope of Salvation: How the Continuing Church of God differ from most Protestants). The eighth-day theology is a lie (cf. Revelation 22:15) and causes people to violate at least one of the Ten Commandments (see also The Ten Commandments and the Early Church and Are the Ten Commandment Still in Effect?). Some articles of related interest may include: Another Look at the Didache, Ignatius, and the Sabbath, The Sabbath in the Early Church and Abroad, Is Revelation 1:10 talking about Sunday or the Day of the Lord?, and Sunday and Christianity. John Calvin held to a variety of non-biblical doctrines. Though he professed to believe the Bible, his actions and teachings suggest that he was not a true Christian teacher. Predestination is simply the part of God's plan that some will be elect and called now. Everyone else is also part of God's plan and those who never had a real opportunity for salvation will have it later. Although this was known by early professors of Christ, John Calvin never figured this out. John Calvin's ideas related to election suggest that he never learned that God is love or that he never really understand salvation. Sadly, he influenced many in the Protestant world, nearly all of whom are still confused about salvation to this day (for details see, Hope of Salvation: How the Continuing Church of God differ from most Protestants). Many still admire John Calvin. I do not. He, like Martin Luther, may have correctly pointed out some problems that the Church of Rome was having during his lifetime, but he did not "reform" far enough. Additionally, he introduced many of his own errors. Errors that to this day contribute to the misunderstanding that many have on election and salvation. More on God's calling can be found in the free online booklet: Is God Calling You?